The Talisman Of The Two Fingers (Illustration No. 82, Plate VI) was symbolical of Help, Assistance, and Benediction, typified by the two fingers extended by Horus to assist his father in mounting the ladder suspended between this world and the next. This Amulet was frequently placed in the interior of the mummified body to enable the departed to travel quickly to the regions of the blest. Amongst the ancient Egyptians the fingers were ever considered an emblem of Strength and Power, the raising of the first two fingers being regarded as a sign of Peace and Good Faith; the first finger being the indicator of divine will and justice and the only one that can stand erect by itself alone; the second representing the Holy Spirit, the Mediator, a symbolism handed down to us in the extension of the index and medius in the ecclesiastical benediction. It is also interesting to note that at the marriage ceremony in olden days the ring was first placed on the thumb, as typical of Man's allegiance to God, and lastly on the third finger of his bride to show that next to God in the Trinity, a man's life should be devoted to his wife. The Collar Amulet (Illustrations Nos. 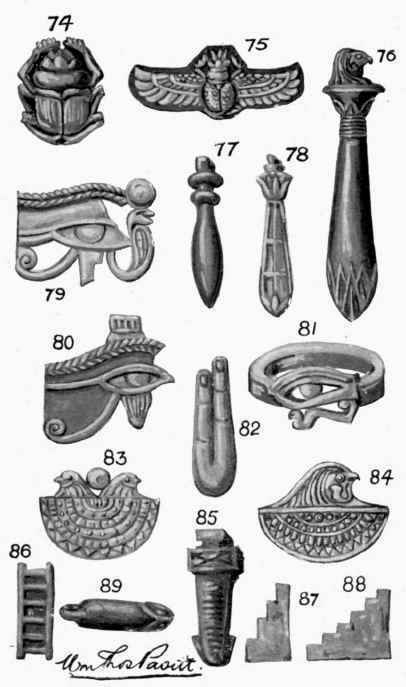 83, 84, Plate VI) was a symbol of Isis, and was worn to procure her protection and the strength of her son Horus. In both examples the head of the Hawk appears, this bird being attributed to Horus as well as to Ra. This collar, which was made of gold, was engraved with words of power and seems to have been chiefly used as a funeral amulet. The Sma (Illustration No. 85, Plate VI) was a favourite Amulet from the dawn of Egyptian history, and is frequently used in various forms of decorated art. It was symbolical of Union and Stability of Affection, and was worn to strengthen love and friendship and ensure physical happiness and faithfulness. The Ladder is a symbol of Horus, and was worn to secure his assistance in overcoming and surmounting difficulties in the material world, as well as to form a connection with the Heaven world, or Land of Light. The earliest traditions place this Heaven world above the earth, its floor being the sky, and to reach this a ladder was deemed necessary. From the Pyramid texts it seems there were two stages of ascent to the upper Paradise, represented by two ladders, one being the ladder of Sut, forming the ladder of ascent from the land of darkness, and the other the ladder of Horus reaching the Land of Light (Illustration No. 86, Plate VI). The Steps (Illustrations Nos. 87, 88, Plate VI) are a symbol of Osiris, who is described as the god of the staircase, through whom it was hoped the deceased might reach the Heaven world and attain everlasting bliss. The Snake's Head Talisman (Illustration No. 89, Plate VI) was worn to protect its wearer from the attacks of Rerek, or Apep, the servant of Set, who was typified as a terrible serpent, which when killed had the power of rising in new forms and who obstructed the passage to the Heaven world. The serpent, although sometimes assumed to be a form of evil, was generally regarded as a protecting influence, and for this reason was usually sculptured on either side of the doorways to the tombs of kings, temples, and other sacred buildings to guard the dead from enemies of every kind, and to prevent the entrance of evil in any shape or form. It was also placed round the heads of Divinities and round the crowns of their kings as a symbol of royal might and power, being one of the forms or types of Tern the son of Ptah, who is thought by some authorities to have been the first living man god of the Egyptians, and the god of the setting sun (in contrast to Horus, who was the god of the rising sun) Tern was typified by a huge snake, and it is curious to note in connection with this that amongst country folk at the present day there is a popular belief that a serpent will not die until the sun goes down.